Proxima Centauri is the closest star to our sun. Moreover, it is believed that the star could host a planet eligible for extraterrestrial life. 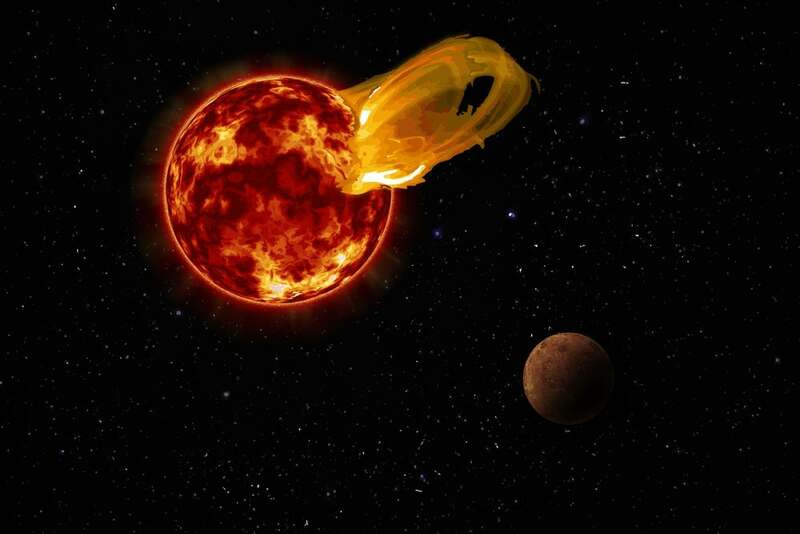 However, scientists observed Proxima Centauri’s recent superflare that was one of the most powerful solar flares that has ever been seen for a star of that size. Although stars of this size can’t be seen in the night sky, this event could have been brought to your attention if you stargazed at the time when the flare burst, according to Allison Youngblood, a postdoctoral fellow at NASA Goddard Space Flight Center. Youngblood and the team studied Proxima Centauri’s superflare which they spotted in March 2016 and published their findings in ArXiv.org, a repository site used by researchers to publish their papers before they officially appear in a journal. According to the study, researchers found that the star brightened by a factor of 68 at that time and managed to unleash 316,227,766,000 petajoules of energy. Our first neighbor star is located at only 4.2 light-years away. However, it belongs to the class of smaller normal stars also known as red dwarfs, capable of providing only dim visible light, releasing a magnitude of 11. Lower magnitude stands for higher brightness and the human eye is capable of perceiving them at magnitudes of only six or seven. The superflare event put the star at a magnitude of 6.8 which would appear as a bright dim star on a clear dark night. The team discovered Proxima Centauri’s solar flare with the Evryscope, housing 24 consumer-grade camera lenses in order to observe events and exoplanets in transition. Additionally, the flare they saw was ten times more powerful as opposed to any superflare that scientists have witnessed from Proxima Centauri. It’s worth noting that Proxima Centauri’s superflare could be deadly to at least one planet in the star system. The planet that is slightly larger than our Earth and is located in the habitable zone of the star. This region supports the right conditions for the planet to sustain liquid water as we know it on Earth. Scientists are still studying the planet, known as Proxima Centauri b, but if Earth was at that same location, those superflares could be deadly. The strong chemical reactions inducted by the star’s flare would affect our Ozone layer and damage it. “We find that within 5 years ozone is 90% depleted and if the star continues flaring at the observed rate, the ozone will be completely gone after several hundred thousand years,” Youngblood was quoted by the site Popular Mechanics. “Then, if another one of these superflares comes along and there is no ozone protection, the UV radiation incident on the planet’s surface would kill even the most radiation-resistant organisms.” Youngblood added pointing out that based on their models of the event, the superflares come with events known as coronal mass ejections, that could damage the planet even more and impact the magnetic fields of the planet along with the ozone layer.